Perhaps, to the “black” books with some stretch can be attributed to “the Codex Gigas” (“the Giant Codex”) is a handwritten set of the beginning of the XIII century, which is now kept in the Swedish Royal library in Stockholm. This Tome is much more known as the “devil’s Bible” because, according to legend, its author was a Benedictine monk-copyist, and the book was created just one night, and not without the help of Satan. Actually, the legend is as follows. A novice monk from the Benedictine monastery in the Czech city (now part of the city Hrasta) committed a sin, and to atone, asked buried alive in his cell. In addition, he gave the Abbot a vow one night to write the wise book in the world, containing in itself all human knowledge. However, as work progressed, the novice realized that to complete it before the dawn in no time. The only way that came to his mind, is to make a deal with Lucifer… the Novice who offered him his soul in exchange for help. And he got it. Of course, Satan decided to intervene in the process of writing and capture it on the pages of the manuscript self-portrait. Page of a manuscript, written in Latin, including fragments of the Hebrew, Greek, and Church Slavonic languages, teeming with images of devils and other evil spirits. However, this is not “Satanic Bible” as her hastily dubbed. It contains the complete text of the old and New Testaments inversion, Dating to the IV century, all 20 books of the “Etymologies” of Isidore of Seville, “antiquities of the Jews” and “Jewish war” of Josephus, “the Czech chronicle” Cosmas of Prague, a collection of edifying stories “the Mirror of the sinner”, a list of monks at the monastery, a number of magic formulas, calendar necrologies and a number of treatises and records. Next, to the “portrait” of the devil, you can see the image of the heavenly city. This author stresses that the person himself is free to choose the path of God − gods, and the devil – the devils. If we are to believe one legend, the first and last edition of “Black magic” was printed in Kiev in the XVI century. On hearing this, the Tsar Ivan the terrible ordered to destroy all copies, and all who were related to the publication, executed or exiled to monasteries to repent there is until the end of life. But there is another version saying that the book is not destroyed, but trapped in a stone pillar. No one can take them out because stopping is imposed on the pillar spell. However, according to rumors, several instances of eerie books all broke up. During interrogation the witness, locked in his chambers, engaged in reading “the black book” and called hell. Boyar not executed, but, deprived of all ranks and estates, were exiled to the far North − Men, near Arkhangelsk. He probably survived only because the searches of his chambers yielded no results – no “black books” detectives have not found. 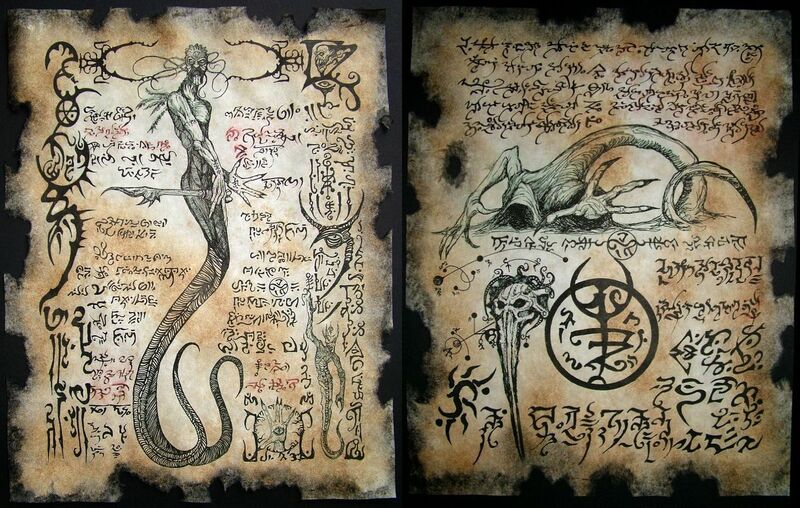 There is a version that Matveev managed to smuggle the “Bible of hell” to the place of his exile. Say, upon ascending the throne, Peter the great tried hard to find a book hidden great uncle. The legend says that the king sent to the Mezen behind the book, his messenger Michael Akulov. But later found in the woods mutilated corpse Akulova stuffed in his mouth with the crucifix. Book when it was not. Another myth claims that a copy of the “Bible of hell” in a vault of the State public historical library in Moscow, in a locked safe. It is extracted out only by the authorities and in the presence of the priest, who holds ready torpedo with Holy water.